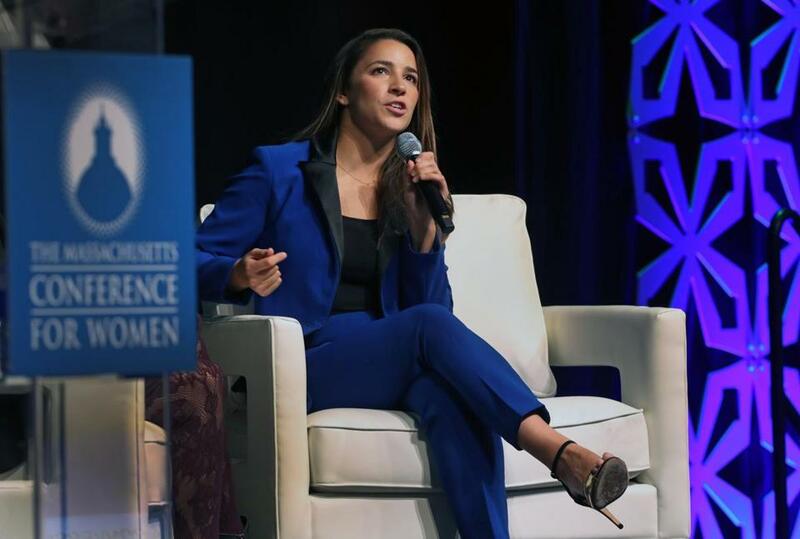 Aly Raisman is pictured as she speaks at The Massachusets Conference For Women event held at the Boston Convention Center. Women of all ages packed the Boston Convention and Exhibition Center for the opening night of the Massachusetts Conference for Women on Wednesday, listening to talks from notables like “Eat, Pray, Love” author Elizabeth Gilbert and comedian Franchesca Ramsey. The biggest cheer of the evening, however, was saved for Needham native Aly Raisman, with attendees rising en masse to applaud and snap photos when the Olympic champion took the stage. During a half-hour talk with Fortune magazine senior editor Ellen McGirt, Raisman discussed some of the issues she’s had with how the media has covered her story of sexual abuse, how she uses meditation to bring balance to her life, and how being a gold medal-winning gymnast doesn’t necessarily make her cool in the eyes of her teenage sisters. About halfway through the presentation, McGirt read an excerpt of Raisman’s testimony during the sentencing hearing of Larry Nassar, the disgraced former national team doctor now serving 40 to 175 years in prison after more than 250 women and girls came forward to say they had been molested by him. The excerpt drew applause from the audience. When asked how she felt sharing her abuse and becoming a vanguard for the #MeToo movement, Raisman took the opportunity to set the record straight about what she feels is an underreported aspect of her experience. Raisman said that both USA Gymnastics and the FBI told her not to go public with her abuse after she reported it. She also said that she wasn’t in the right mindset to go forward publicly at the time, regardless. Near the end of the talk, Raisman said that she often finds herself needing to take breaks from giving talks about sexual abuse, and has tried to find different ways to combat the headaches and fatigue she often experiences after repeatedly recounting such a dark time in her life. She said she regularly attends therapy, has taken up gardening, and heavily advocates for everyone to learn meditation. On a lighter topic, McGirt asked Raisman, the oldest of four children, what her younger siblings would say about her leadership style as the oldest sister. Raisman said that while her younger brother is very supportive, her younger sisters are at the age right now where they’re a bit less concerned with what’s going on in her life.